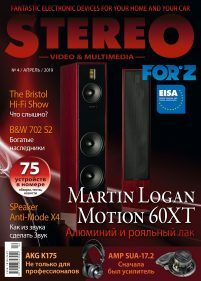 Stereo,Video&Multimedia (SV&M) was launched in 2008 and is an independant Ukrainian home audio-video and multimedia magazine which tests amplifiers, home theatre packages, speakers, cables, TV sets, projectors, multimedia players and other products. Today we are the one home AV magazine in Ukraine, giving practical advices to our readers. We have written reports from the most important European and National Hi-Fi shows and the latest news, vintage equipment and brand lines, home theatre installations and product review. The languages are Ukrainian and Russian. “We are very happy to be a part of EISA, the biggest and famous European organization for home, car, photo and mobile electronics magazines. We were joined to EISA in difficult for the Ukrainian economy and an independence time, but we hope that the high standards of EU and of the Association will help to our edition getting better to our readers”.